According to the apostle Paul, when the Savior first administered the sacrament to His disciples in Judea, He took the broken bread and said, “Take, eat: this is my body, which is broken for you: this do in remembrance of me” (1 Corinthians 11:24, emphasis added). In his gospel account, Luke used somewhat softer language: “This is my body which is given for you: this do in remembrance of me” (Luke 22:19, emphasis added). Both, however, evoke the image of sacrifice. To the Old World disciples, the bread represented the body given and broken in sacrifice on their behalf. In contrast, when the Lord first administered the sacrament to the Nephites, He instructed, “this shall ye do in remembrance of my body, which I have shown unto you” (3 Nephi 18:7, emphasis added). The body shown unto the Nephites was not the broken, sacrificed, mortal body of Jesus, but rather it was the resurrected, glorified body of the risen Lord. As John W. Welch noted, “when we partake of the bread, we should remember that we eat not only in remembrance of the body that has been broken for us—that’s the New Testament language” but also “in remembrance of the physical, tangible body” with which the Nephites had direct, physical experience. Here the Savior was calling the Nephites to remember His physical and painful sacrifice as well as His triumphant resurrection. As S. Kent Brown pointed out, “his body, of course, is the first thing he allows people access to,” but this access was “to touch the scars in his hands and his feet and his side,” all of which were physical reminders that His glorious body had been broken and sacrificed. Thus, Wright explained, “To a people steeped in Mesoamerican culture, the sign that a person had been ritually sacrificed would have been an incision on their side—suggesting they had had their hearts removed.” While righteous Nephites themselves would not have participated in human sacrifice, its prevalence within surrounding cultures could well have had some effect on their processing of this amazing experience. Hence, Wright reasoned that by inviting the Nephites to first “thrust your hands into my side” (3 Nephi 11:14), Christ “may have been communicating with them according to their cultural language.” When being asked to remember the body shown unto them, surely the Nephites couldn’t help but recall this vivid experience, as they touched the tangible tokens that Jesus’s resurrected body still bore as a result of His infinite atoning sacrifice. The Savior’s invitation to the Nephites to remember the body they were shown is another instance where He subtly yet appropriately adapted His instructions to reflect unique aspects of the Nephite experience. This adaption began at the very moment He showed His body to them—with the invitation to first feel the wound on His side thereby personalizing and maximizing the impact of their experience with His resurrected body. For Latter-day Saints today, the Savior’s administration of the sacrament to the Nephites is the ultimate source of the sacrament prayers heard each Sunday. 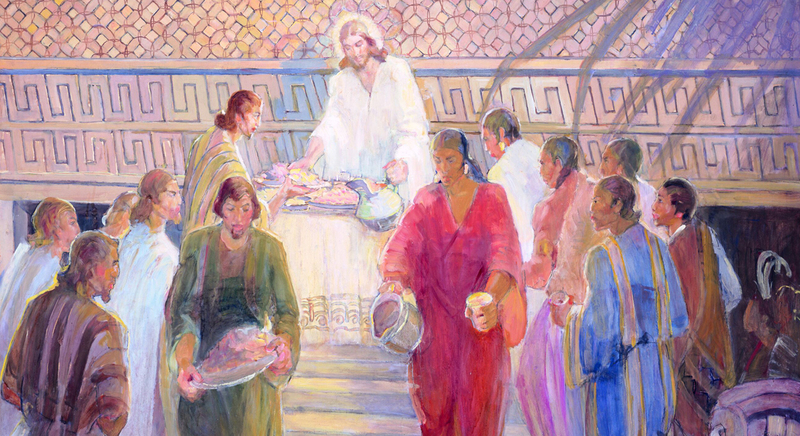 Thus, when partaking of the bread and water each week, “we celebrate the sacrament, not only of the Lord’s supper, but also of the Lord’s appearance in 3 Nephi.” Book of Mormon readers, therefore, have the privilege of remembering not only the broken, sacrificed body, but also the victorious, risen body shown to the people at Bountiful. Both Matthew and Mark merely said, “Take, eat; this is my body” (Matthew 26:26; Mark 14:22). John W. Welch, in “3 Nephi Conference Panel Discussion,” in Third Nephi: An Incomparable Scripture, ed. Andrew C. Skinner (Salt Lake City and Provo, UT: Deseret Book and Neal A. Maxwell Institute for Religious Scholarship, 2012), 381–382. S. Kent Brown, in “3 Nephi Conference Panel Discussion,” 381. Mark Alan Wright, “Axes Mundi: Ritual Complexes in Mesoamerica and the Book of Mormon,” Interpreter: A Journal of Mormon 12 (2014): 91. In John, Thomas demanded that he would not believe unless he could feel the prints from the nails and thrust his hand into Jesus’s side, which he was allowed to do (John 20:25–28). Notice that thrusting his hand into Jesus’s side, however, comes after first feeling the nail marks in the hands and feet. In 3 Nephi Jesus takes the initiative and invites all first to thrust their hands into his side, then to feel the prints of the nails in his hands and feet. Feeling the imprints of the nails in his hands and feet might have attested to the fulfillment of prophecies, long known to the Nephites, that the Lord Jesus Christ would suffer death by crucifixion. See 1 Nephi 11:33; 19:10, 13. For the ancients, emotion was not felt in the heart, but rather in your gut, or your bowels (splanchnizomai means to feel compassion or pity, and it comes from splanchna, or the inwards parts and entrails). So Christ showing the incision in his side not only declares his ritual sacrifice, but it demonstrates his emotional and loving sacrifice. D. Todd Christofferson, “Abide in My Love,” Ensign, November 2016, forthcoming online at lds.org. Welch, in “3 Nephi Conference Panel Discussion,” 381.